Who’s that sniffling in my house? Time to rest and put to bed your fears. Is that a cold sneaking into my house? 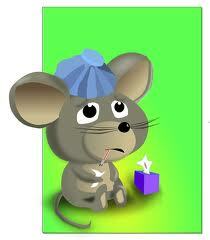 Chicken soup, for my mouse, to clear up the snot. A spoon full of sugar will help us begin. Who’s that running around in my house? I guess that cold just met its match. Every now and then I enjoy writing down the little nonsense poems that I would make up on the fly and tell my children. This is one of those little limericks that I would sing-song to them if I heard an unsuspected “Achooooo” in the house. ~~Nothing in this world is more wonderful than the giggle from a child.